before adding new parts to the pirelli romance, let’s enjoy this graceful unknown chanel advertisment that img uploaded in the renewed daria page. i saw it 2 days ago, but my intention was to solve the mystery before posting about it. now i see it was posted at tfs, so maybe a public appeal is better: does anyone know where and when it comes from? this picture is very beautiful imo. there’s something classical and elegant that i honestly prefer to any pirelli pastiche. actually that’s the other side of daria’s work that i like: a genuine fashion modeling with no focus on sexiness. 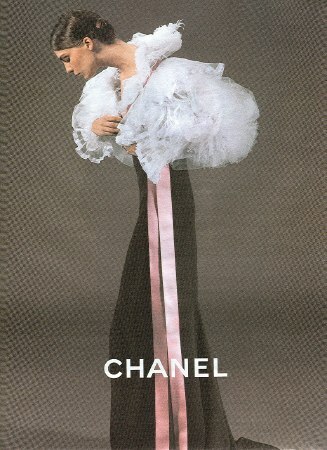 and please note the early 20th century reference, like a renewed modernism that recovers the origins of chanel myth. and who’s behind such a perfect meeting of chanel and miss daria werbowy? karl lagerfeld?